Found you on the web. Can you help? I have a waterbed with softside support for the mattress. 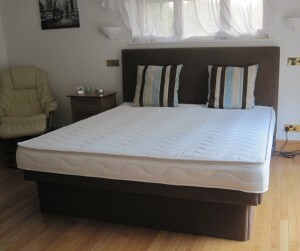 It has thinner foam at the top of the mattress level and thicker at the bottom. So the waterbed mattress has a larger rectangular area on the top where we lay, and smaller where the waterbed heater goes. It also has maximum restriction or stability, so no waves, so we do not disturb each other. The waterbed mattress is 10 years old and I need a replacement . Can you supply / make one for that? It is about 5’3″ wide on the top surface, maybe 4’11” at heater level. We all know that spring and foam mattresses give a relatively short period of supportive life before they begin to sag. A waterbed mattress however can last much longer, cost much less and give better support. *made from thinner vinyl than our deluxe range of waterbed mattresses. *Cut smaller to reduce material cost. *Made from a lower cost general purpose vinyl. *Comes with a standard two year guarantee. *£50 More expensive than our standard range of mattresses. *Made from thicker vinyl than our standard range. *Generously cut to fit, ensuring perfect support. *Made with vinyl specifically developed for waterbed mattresses. *Comes with a standard five year guarantee. *Life expectancy, eight years plus. We are back from holiday in freezing cold England. It is very nice to get back to a warm comfortable bed. As you know waterbeds are temperature controlled, see our waterbed accessories for more details. If you have an existing hardside or softside waterbed and need to replace the old heater, this can be done without emptying the water mattress. Please read the blog and watch our video. 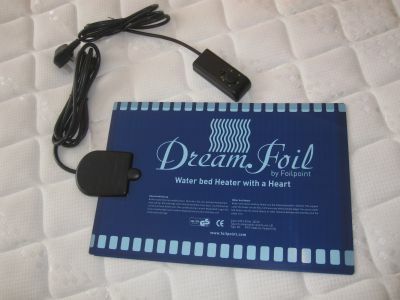 If you require a replacement waterbed heater you can buy online and we will send by next day carrier. Since we stopped producing the solitaire waterbed combined with an adjustable bed base, we have received far more enquiries from potential buyers. The Solitaire was specifically designed to be a light weight single waterbed to be used by children or elderly. With the obvious benefits that only a waterbed gives such as no dust mites, perfect for asthma sufferers. Temperature controlled, perfect for everybody, warm in winter and cool in the summer. And comfort, no other mattress supports as well as a waterbed mattress. Why did we stop producing it?